Back in April, we first reported that iOS 7 will feature much-enhanced in-car integration for Maps, Siri and other apps. 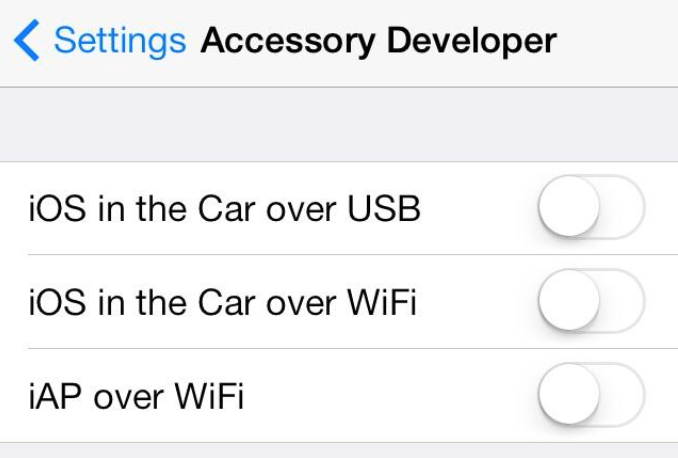 This feature allows an iOS 7 device user to connect their iPhone to a car and an Apple-built “iOS in the Car” interface will appear in the center console display. Hamza Sood, who has located several hidden features in iOS 7, corroborates this with a finding inside of internal Accessory Developer options in iOS 7. These settings say iOS in the Car can work over WiFi, and this goes nicely with our independent iOS in the Car over AirPlay claims. We also understand that Apple is already at work on a point update (perhaps iOS 7.1 or 7.2), and this new version will begin building in support for iOS in the Car. Apple says that iOS in the Car will formally launch in 2014 with several car makers.